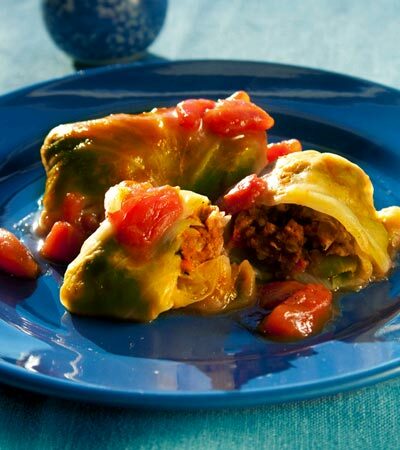 A low fat and high in fiber vegan stuffed cabbage roll recipe. Soy free. Great served with rice or potatoes. Want to know what others thought about this recipe? Would you like to comment on this recipe? 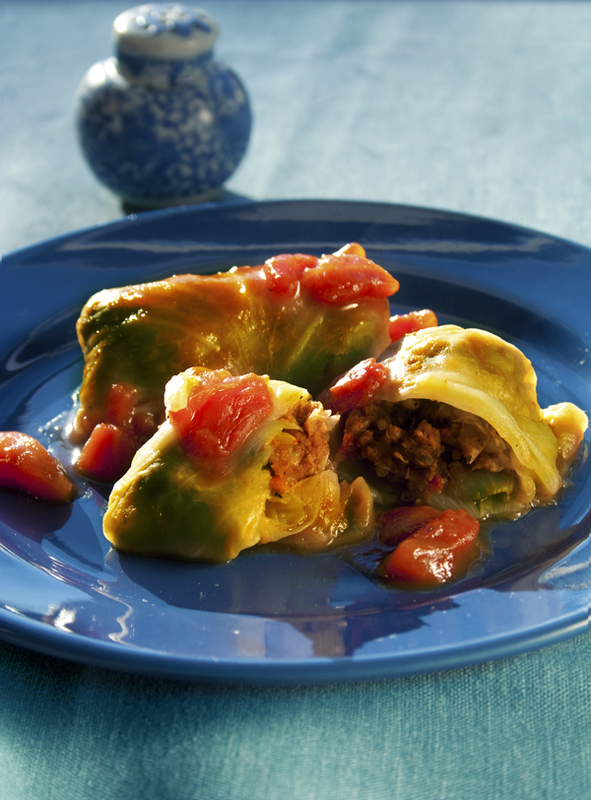 Go to the Cabbage Rolls (Low Fat & Soy Free) blog entry. In a skillet, place carrots, onions, peppers and water. Simmer on medium to low heat for 5 minutes, stirring occasionally. Let cool and put into mixing bowl with the rest of the stuffing ingredients. The cabbage leaf has a tough middle vein at the bottom, so we want to trim that down before cooking them. Do that by taking a knife and carving it down without cutting a hole. In a large pan place cabbage leaves and fill with water until the leaves are covered. Bring to a boil and let cook on medium heat for 15 minutes. Reserve a cup of the water you cooked the leaves in to cook the cabbage rolls in. Drain leaves and then cool them down with cold water. Drain again. Divide stuffing mixture into 9 equal parts and spread it into the middle of the cabbage leaf. Roll the bottom of the leaf over the mixture. Fold each side into the center and roll up. Place into a 9 inch glass casserole dish with lid. Pour the reserved liquid from the cabbage leaf water on top of the rolls. Place into oven and cook for 1 hour or until fork tender. At mid baking time take them out of the oven and turn them over. Place back in the oven. While that finishes cooking mix up the sauce. In a small saucepan place diced tomatoes, brown sugar, balsamic vinegar, starch, ginger root, lemon pepper seasoning and garlic powder. Stir together and heat until it comes to a boil. When rolls are done cooking, take them out of the oven and pour sauce on top. Place back in the oven and cook another 10 minutes.